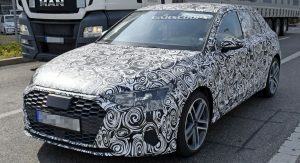 Audi’s next-generation A3 Sportback has been spied out and about recently wearing some rather psychedelic test-mule cladding. 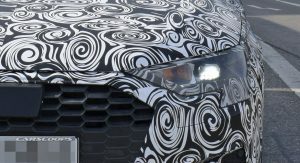 Fortunately for us, much of the design is apparent though the camouflage leaving only details to the imagination. So, how does it look with no camo altogether? 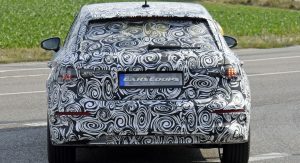 Well let’s take a rendered first look at Ingolstadt’s upcoming Mercedes-Benz A-Class fighter in all its redesigned glory. Now entering its fourth-generation, the 2019 A3 replaces the current car,which has been in service since 2012 and was one of the first Volkswagen Group models to use the flexible MQB architecture. 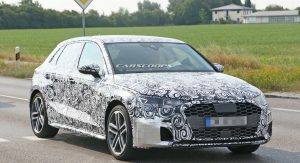 The new A3 is expected to raise the bar in response to Mercedes-Benz’s latest A-Class, although it will only be offered in 5-door Sportback and sedan iterations this time round, as consumer appetite for 3-door hatches is waning across the board. As with many new arrivals from Audi, you won’t see any radical design changes. Here it’s all about adapting the freshest look in an evolutionary sense. Frontal styling is dominated by Audi’s large single-frame grille, flat hood, matrix LED headlights with larger lower cutouts and angular DRL’s. 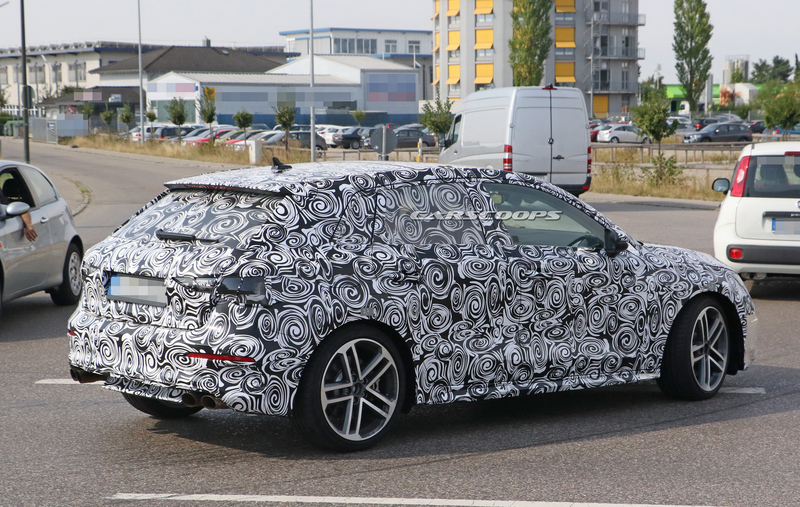 Side surfacing along the doors features deep lower scallops and an sportier roofline with slimmer rear quarter windows (like Audi’s latest Q3). LED tail lamps have a similar outer shape to the front headlights, whilst the rear bumper features chiselled cutouts containing slim reflector lenses. S3 models have exposed exhausts, whilst they’re hidden in lessor variants. 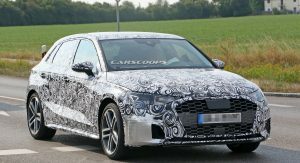 Whilst we’ve yet to set eyes on the design of the cabin, expect the A3 to grow slightly in dimensions, fixing that bugbear of the current car – cramped rear legroom. 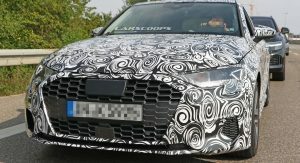 Expect similar tech to filter down from the 2019 Q3; like its Virtual Cockpit gauge cluster, large touch-screen MMI setup with haptic feedback, wireless phone charging, Android Auto & Apple CarPlay, 680 watt Bang & Olufsen premium sound and a myriad of customization options. 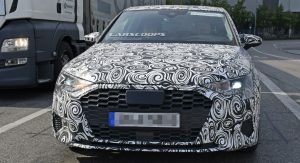 As with the outgoing A3, the new car will continue to use the German brand’s flexible MQB architecture. 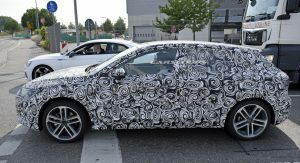 This common platform will also underpin VW Group siblings like the upcoming Volkswagen Golf Mk8 and new SEAT Leon, both of which are tipped to debut next year. Count on subtle refinements when it comes to steering and suspension, along with more driver assist technology; such as adaptive cruise with stop-and-go, traffic jam assist, park assist and active lane keeping. We anticipate a range of turbocharged four-cylinder petrol engines in 1.5-litre and 2.0-litre guises, with outputs ranging from 150 to 230 hp. A diesel offering will also be available. 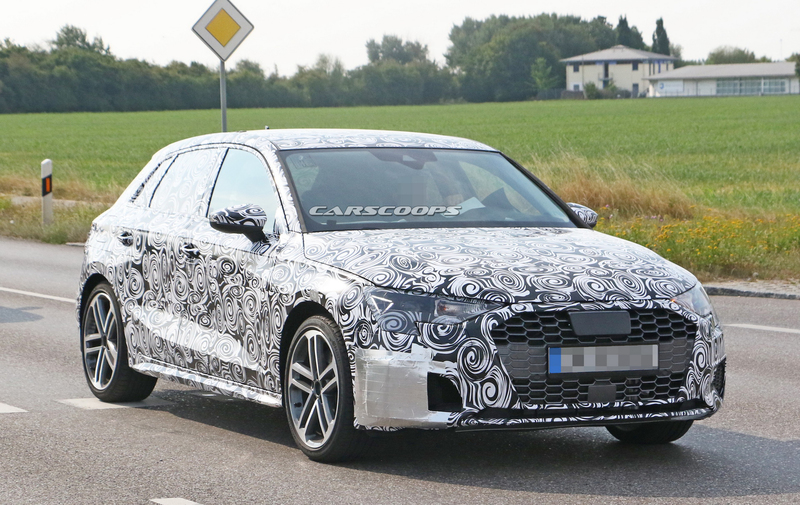 Power will be fed to the front wheels through a (not for North America) six-speed manual or seven-speed, dual-clutch transmission on lesser variants; whilst Quattro all-wheel drive will be available on higher trim levels. 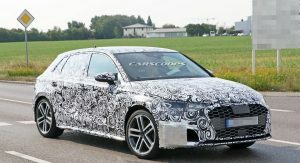 An e-tron hybrid variant and the turbocharged, high performance S3 and 400+ hp RS3 will follow at a later date. 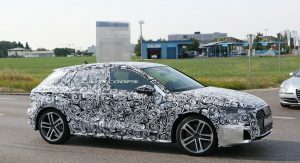 The new A3 will battle it out for compact luxury honors among the technological tour-de-force that is the new A-Class and its clever MBUX infotainment setup, BMW’s 1 Series and Volvo’s soon-to-be-replaced V40. Other rivals include higher spec variants of Volkswagen’s Golf, Mini Clubman, SEAT Leon, Renault Megane, Ford Focus Vignale and Mazda3. As for its official reveal? 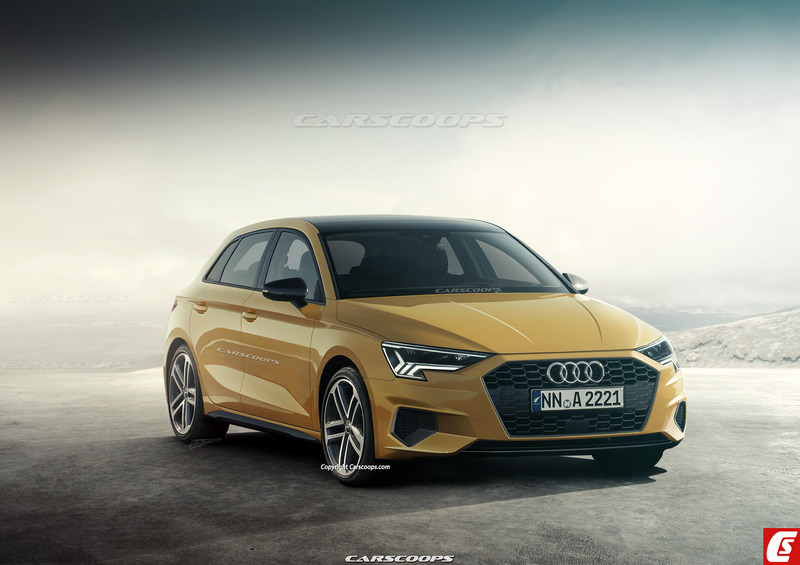 Expect a launch for the regular A3s in late 2019, with the hotter S3 and RS3 coming on stream at an later date. Audi A3 or Mercedes-Benz A-Class – what would you choose? Share your thoughts in the comments below. 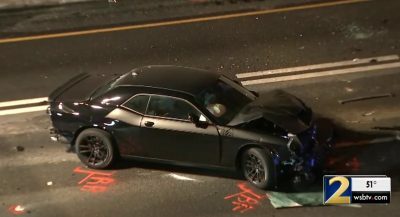 Did they render the car because I can’t see the main picture. Is anyone else experiencing this? No they didn’t. It’s click bait. 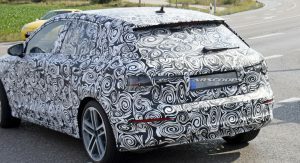 Glad Audi have dropped that large 3rd window which always gave the the previous two 5 door versions a rather dowdy mini-estate car look. 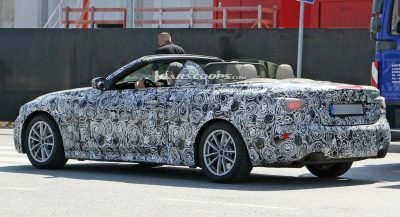 This should be much better looking, like the first generation 5 door. This was like this because Audi wanted to create a middle point between a station wagon and a hatch, being previous generations crossover vehicles. 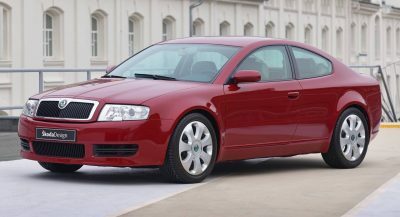 Skoda Rapid is also an example of this within VAG. The Golf is too important. Ooof! That interior (virtual cockpit excepted) is as dull as f*&$. To these eyes it possibly looks a step back in quality from the previous. That’s the interior of the Q3. Previous gen of Q3 had interior more closer to A1, but i think that new A3 gonna share same interior as Q3. It looks nice but the interior is waaaay to similar to the new Jetta’s. See previous comments, or the article about that. Looks lovely inside and out. I’m still choosing the A-Class because I ordered one and it will hopefully arrive in early November. VW and Audi are recreating the 80s. Cool! I loved the VW Rabbit/Golf Mk I. The death of the U.S. steel industry, Reaganomics, the second half of the Malaise Era, and Star Trek V, less so. The 7-speed dual-clutch gearbox is not on lesser models, on the contrary, it’s on quattro and upper models. Sadly it’s completely flawed, even more so than the previous version, so stay away from that until they finally decide to listen to their customers and fix or redesign it. NIce… Will be interesting to see when it actually gets here. As much as I like the DSG, it takes all the fun out of cornering properly, even with a tune. The A3 is much better designed inside and out, compared to the M-B GLAs. Haha, yes, he didn’t seem to like that either. Could you put 200,000 miles on one of these?